LG Google Nexus 5X, LG V20, LG G5. Nokia Microsoft N1, Lumia 950, 950XL. Huawei Google Nexus 6P, P9 Plus, Nova Plus. HTC 10 U11. LED light power indicator. - HTC One M9 / M8. Compatibility: USB Port. Syncs and transfers files via Type C data cable. Supports Adaptive Fast Charging. DESIGN: Enhanced Smart IC Internal Circuit to provide protection from short circuit, over charging and over heating. Syncs and transfers files via Type - C data cable. DESIGN: Enhanced Smart Internal Circuit to provide protection from short circuit, over charging and over heating. Safe and SturdyDESIGN: lightweight, compact and easy to carry on-the-go. LG Nexus 5X. Fast Charging Output: 9V-2A/12V-1.5A(18Watts),5V 2.4A(12Watts). Samsung Galaxy Note 7. For Sony Xperia X Compact. Color :Black. You may also like. OnePlus 2 Two. For HTC 10 M10. DESIGN: Enhanced Smart Internal Circuit to provide protection from short circuit, over charging and over heating. Safe and SturdyDESIGN: lightweight, compact and easy to carry on-the-go. Syncs and transfers files via Type - C data cable. Works with Adaptive Fast Charging (AFC) compatible devices Sync and transfer files via TYPE C USB data cable. Syncs and transfers files via TYPE C USB data cable. Syncs and transfers files via Type C data cable. FAST CHARGING feature is available only with Fast Charging Enabled cellphones such as Samsung Galaxy S8 / S9 / S10 / Note 8 / Note 9 / Google Pixel 2/3, 2/3 XL, OnePlus 4,5,6 etc. Samsung Galaxy S9. Samsung Galaxy S9 . DESIGN: Enhanced Smart IC Internal Circuit to provide protection from short circuit, over charging and over heating. Safe and SturdyDESIGN: lightweight, compact and easy to carry on-the-go. Syncs and transfers files via Type C data cable. Fast Charging Output: 9V-2A/12V-1.5A(18Watts),5V 2.4A(12Watts). Color :Black. You may also like. LG Google Nexus 5X, LG V20, LG G5. Huawei Google Nexus 6P, P9 Plus, Nova Plus. LED light power indicator. Compatibility: USB Port. Samsung Galaxy S6 / S6 Edge / S6 Edge (Plus), S7 / S7 Edge. LG G5 Flex G6. Dual output: one with a 9ft Micro USB cable and one with standard USB port. The adapter plugs directly into your car's cigarette lighter socket for maximum convenience. Fast charging capabilities brings your phone from 0 to 50% in 30 minutes, Perfect for short or long car rides, Compatible with all devices with a USB-C port. Micro USB devices. With the new Adaptive Fast Charging technology for Galaxy S6, Galaxy S6 edge, Galaxy Note 4 and Galaxy Note edge. Rapid Charging. 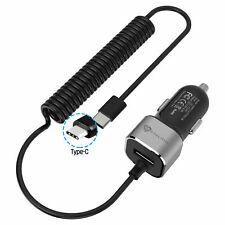 Adaptive Fast Charging USB CLA Adapter. with just a standard 2 amp charging rate. 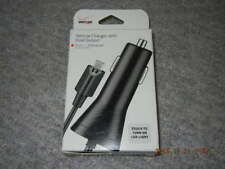 CAR ADAPTER MINI C-TYPE BLACK. Item model number:EP-LN930CBEGUS. Item Weight:3.2 ounces. LOWEST USED PRICE:9.99. I will do my best to fix any issue that may arise. Can I make mistakes, YES. When that happens I do everything I can to make things right. Compatible with all cars, trucks and vehicles which support a 12-24V cigarette lighter charging port. 2A charging and higher is dependent on phone model. Look no further! iPhone-Lightning or Micro USB cable not included. Compatible with all cars, trucks and vehicles which support a 12-24V cigarette lighter charging port. Look no further! iPhone-Lightning or Micro USB cable not included. USB to Type-C. iPhone and Micro-USB charging cable not included. Compatible with all cars, trucks and vehicles which support a 12-24V cigarette lighter charging port. Look no further! iPhone-Lightning or Micro USB cable not included. iPhone and Micro-USB charging cable not included. Compatible with all cars, trucks and vehicles which support a 12-24V cigarette lighter charging port. Look no further! iPhone-Lightning or Micro USB cable not included. High Speed with Integrated Smart IC for Fast Charging.